Apparently a more typical (spotted) individual but otherwise similar to this one found on the same night in the same town on a nearby building. 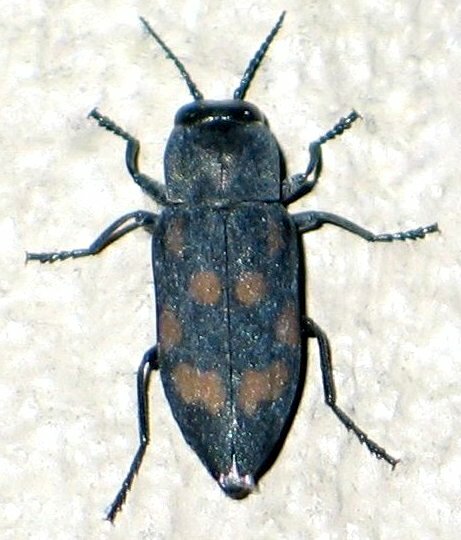 The beetles in this genus tend to appear in numbers at forest fires, so I'm wondering if there is a blaze going on nearby. but there may have been a small fire nearby. "Linsley observed both M. consputa and M. acuminata swarming at football games in Berkeley, California, and speculated that they may have been attracted to the smoke from approximately 20,000 cigarettes (Linsley, 1943)."